The colorful tweed makes this dress easily transitional. I needed a jacket for the cooler temps in San Francisco but I think this dress would be equally darling sans jacket and with a hot pink heel to bring out the pink hues in the dress. Also, if you work in a more corporate environment, adding a chic black blazer and switching out the sandals with black pumps and black tights could easily take this dress into the workplace. 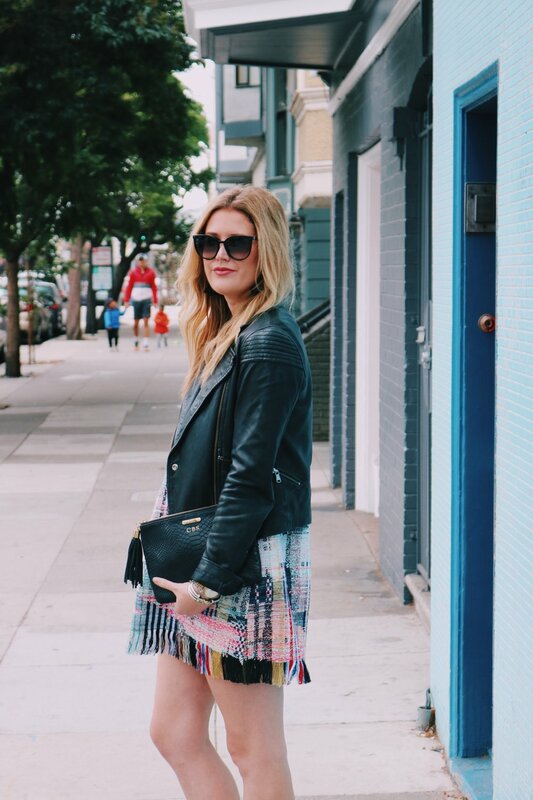 As I mentioned in yesterday's blog post, I love adding a more masculine touch with my leather jacket to an otherwise very feminine dress to make it a little more edgy and add a flair of "street style. "Ladies, if you do not already have a leather jacket like this one, I highly recommend investing in one. There are tons of cheaper options out there if you choose to go the faux leather route. However, a genuine leather jacket will take you far in life and I promise it is an evergreen investment meaning it will not go out of style.